(10222, W. A. Rigg Collection, OHS). The seat of Dewey County, Taloga lies almost in the center of the county and is situated in the horseshoe bend of the main (South) Canadian River. The town is accessed by State Highway 183 and is thirty-seven miles north of Clinton, Oklahoma. It has been said that the Taloga is an Indian word meaning "beautiful valley," although in other accounts it is a Creek word meaning "rocking water." Taloga was within County D, created from the Cheyenne and Arapaho Reservation, which was opened for non-Indian settlement by land run on April 19, 1892. Prior to the opening, federal surveyors had laid out the townsite surveyed on 320 acres, and a post office had been authorized. The plat included a courthouse square, and a business district and lots were set aside for churches and residences. During the first days of settlement members of the original Dalton gang, as well as other outlaws of the day, are said to have filed on lots, using fictitious names. The first public water well, dug in the intersection of Main and Broadway streets, was used as a watering place for decades. 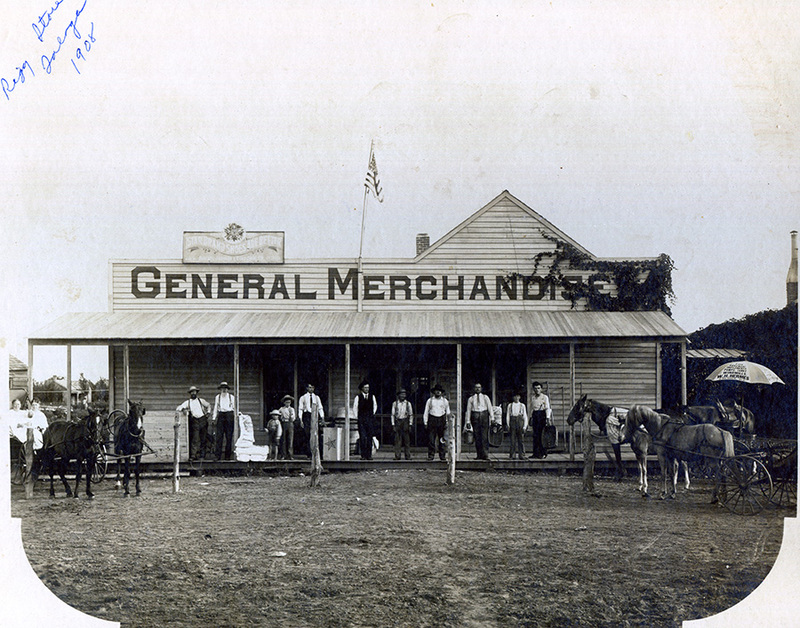 Early businesses included Emery Black's livery stable, dentist W. T. Raffington, Dr. E. W. Vanbrunt, John Dedrick, photographer, and Milton Shultise's mercantile store. The first County D offices were housed in a frame building at Main and Broadway. By 1898 the town's several hundred residents included eight livestock dealers and breeders, and in 1901 a courthouse was constructed. In 1906 the community incorporated, and after statehood, with 430 inhabitants, Taloga remained the seat of Dewey County, as D County was renamed. A more modern county building erected in 1925 is listed in the National Register of Historic Places (NR 85000680). A concrete jail constructed south of the courthouse and used from 1922 until 1981 houses the Dewey County Jailhouse Museum. The community's population in 1910 was 468, and in 1920, at 365, according to the U.S. Census. In the 1910s the town supported three churches, two banks and two weekly newspapers, the Taloga Advocate and the Taloga Times, which later combined and became the Taloga Times-Advocate. Educational institutions were important to early-day residents. A normal school was opened in 1901 for students wishing to further their education past the eighth grade. In 1923 a new public school building was erected, only to burn in 1930 and to be rebuilt in another part of town. This second school burned in 1981 and was replaced by a modern facility on the same grounds. Despite never having had railroad access, the town remained the county seat. By the 1920s Taloga flourished, as evidenced by the construction of a new courthouse, jail, and school. An electric plant operated, and street lights were installed. A flour mill and ice plant operated, and a large community building was erected on Broadway. A hotel was built on Main Street. Lloyd's Hospital, a private facility, opened in 1929 and served as the county's only hospital. After the onset of the Great Depression the 1930 population stood at 436 and peaked at 533 before World War II. Economic activities before the war included farming, produce raising, and livestock raising. Petroleum exploration began in Dewey County in the 1920s, and since the 1950s oil and gas production has added to the community's wealth. In 1960 and 1980 Taloga had 322 and 446 residents, respectively. Farming and ranching remained important throughout the twentieth century, and various small-town agribusinesses and a bank continued to serve area farmers. Prekindgergarten through grade twelve enrolled 131 students in 2005. In 2000 the U.S. Census counted 372 residents, and the 2010 census counted 299. Frank D. Northrup, "An Incident in the Early History of Dewey County," The Chronicles of Oklahoma 3 (December 1925). Dee Ann Ray, "Taloga," Woodward (Oklahoma) News, 23 September 1986. J. E. Ruble, Frank Rigg, and G. W. Payne, "History of Taloga," Taloga (Oklahoma) Times-Advocate, March–May 1936. "Taloga," Vertical File, Research Division, Oklahoma Historical Society, Oklahoma City. Corene Seal and Etta Petree, "Taloga," The Encyclopedia of Oklahoma History and Culture, https://www.okhistory.org/publications/enc/entry.php?entry=TA009.